(FOX 26) - The Baytown Police Department has confirmed that a 58-year-old woman was taken by LifeFlight medical helicopter to Memorial Hermann Hospital - Texas Medical Center after she was bitten on the arms and legs by at least ONE OF TWO DOGS in the home. Firefighters and an animal control unit first arrived to the Baytown home following the initial report of the dog bites. After the woman had let the dogs run outside, at least one of them attacked her when she let them back inside the home. She was caring for a six-year-old child at the time. 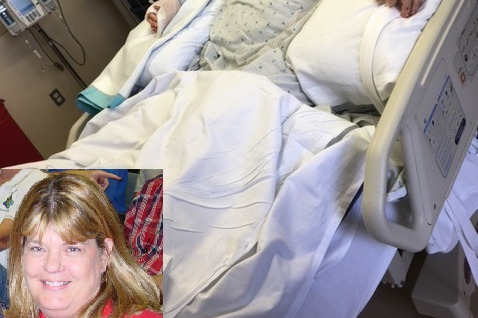 Jeanne was attacked by TWO PIT BULL DOGS on Saturday, August 11 while babysitting her granddaughter. She was unable to free herself from the dogs and was going into shock when her son, Patrick, arrived and saved her from the attack. There was serious muscle, tendon and tissue damage to Jeanne's arms and legs as well as her neck area. She had been on a ventilator for five days and it was finally removed last night, Aug. 15, which allowed her to breathe and talk on her own. She has already experienced three surgeries to remove tissue and muscle, cleanse wounds to stop infection, and we are hoping she will regain hand dexterity and leg movement in the days ahead. Pain is an issue and the hospital (Memorial Hermann-TX Medical Center Burn Unit) is doing an outstanding job. The injuries were severe and she will experience many more surgeries and skin grafts in the days and months ahead as well as physical and occupational therapy. This incident may affect her ability to work in the near future, plus she will have insurance deductibles and large costs not covered which is the reason for the fund. We will explore short-term disability as well in the meantime. If you’re able to help, any and all donations to this fund will be greatly appreciated by Jeanne, her sons Patrick and Eric, and her family.